Toyota's HiAce range has taken a step forward with a more powerful and more efficient petrol engine and the introduction of two new variants including a five-seat crew van. Toyota executive director sales and marketing Tony Cramb says the two new variants - diesel crew van and petrol 12-seat bus - are being introduced in response to demand from business owners and operators. "The five-seat crew van enables drivers to transport fellow workers during the week and family members at other times," Cramb says. "Offering a 12-seat bus that can be driven on a standard licence will be much appreciated by tour operators and other users, saving them the cost of doing their own conversion. 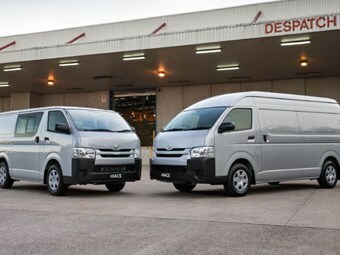 "Simultaneous increases in output and fuel economy for the petrol engine, standard fitment of vehicle stability control and other safety features, plus other additional features will ensure the ongoing popularity of HiAce as Australia's best-selling van and top-selling bus." The option of reducing the number of seats in the petrol commuter bus by two to 12 has been added so the vehicle can be driven on a standard licence. Every new HiAce is now equipped with the safety of electronic vehicle stability control, brake assist for greater stopping power in an emergency, hill-start assist control and an emergency stopping signal. Other features include power operated mirrors, front windows and door locks, an LCD Multi-Information Display, hands-free telephone operation and voice activation for the audio and phone. Commuter bus models have the option of a power-operated sliding side door. Last year the HiAce commanded more than 90 per cent of the light bus market segment with 2,615 sales.